Thes walimex pro 85/1.4 IF lens is a classic portrait lens, which expands the creative range in photography. 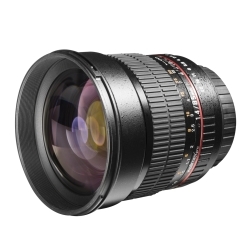 The lens has a focal length of 85mm and a lens speed of 1:1.4 and a mechanical aperture ring. It is optimized for medium and farther distances and provides a very high and sitortion-free imaging quality, which can be further enhanced by stopping down. 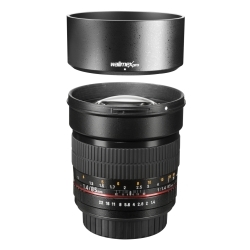 Due to the fast lens speed the walimex pro lens allows the use of shorter shutter speeds or lower light sensitivitiy. This reduces the noise in images when shooting with digital cameras. It facilitates the emphasizing of motifs in front of blurred fore- or backgrounds due to its fast lens speed and light tele impression. When using SLRs, the fast lens speed benefits the brightness of the viewfinder, which makes focusing easier. The large aperture opening with a small field of depth optimizes the position of the focus level in the viewfinder. Like this the focus progression can be assessed more accurately. 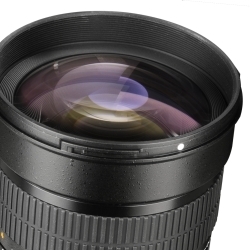 The lens is inner-focusing. This is a technique where not all but one or few lens groups are moved on the inside for focusing. The filter thread does not turn when you focus and the balance point stays nearly the same. The aperture is built of eight blades, which allows very plastic light effects. 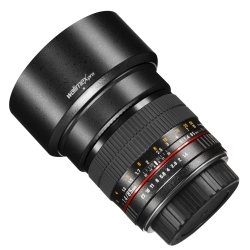 In order to keep light transmission on a very high level, all lenses were coated with anti-reflex layers.